The University of Washington Climate Impacts Group has been analyzing the potential effects of climate change in Puget Sound. The projections below represent some of their most recent reporting about expected conditions in the region over the next 50 to 100 years. Support for this article was provided by the Puget Sound Partnership. All scenarios project warming for the 21st century. The graph shows average yearly temperatures for the Pacific Northwest relative to the average for 1950-1999 (gray horizontal line). 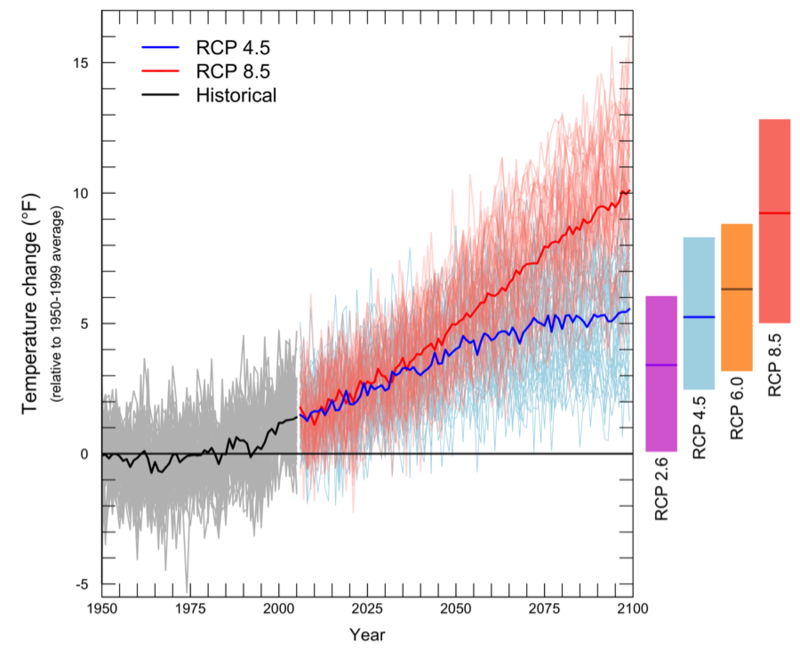 The black line shows the average simulated temperature for 1950–2011, while the grey lines show individual model results for the same time period. Thin colored lines show individual model projections for two emissions scenarios (low: RCP 4.5, and high: RCP 8.5)[ ], and thick colored lines show the average among models projections for each scenario. Bars to the right of the plot show the mean, minimum, and maximum change projected for each of the four emissions scenarios for 2081-2100, ranging from a very low (RCP 2.6) to a high (RCP 8.5) scenario. Note that the bars are lower than the endpoints from the graph, because they represent the average for the final two decades of the century, rather than the final value at 2100. Figure source: Climate Impacts Group, based on climate projections used in the IPCC 2013 report. Puget Sound and the Pacific Northwest are experiencing a suite of long-term changes that are consistent with those observed globally as a result of human-caused climate change. These include increasing temperatures, decreased glacial area and spring snowpack, earlier peak streamflows in many rivers, and rising sea level at most locations. Natural variability can result in short-term trends that are opposite those expected from climate change, as evidenced by recent regional cooling and increases in spring snowpack. Projections indicate continued increases in average annual Pacific Northwest temperatures as a result of global warming. Projected changes in annual precipitation are small, although heavy rainfall events are projected to become more severe. Regionally, sea level will continue to rise in concert with global sea level. Locally, sea level is projected to rise in most locations, with the amount of rise varying by location and over time. In addition, the Puget Sound basin is projected to experience decreases in snowpack, increases in stream temperatures, and widespread changes in streamflow timing, flooding, and summer minimum flows. Natural variability will continue to influence shorter-term (up to several decades) climate trends. Note: Only a few of the changes cited below are specific to the Puget Sound basin. However, many characteristics of Puget Sound’s climate and climate vulnerabilities are similar to those of the broader Pacific Northwest region. Results for Puget Sound are therefore expected to generally align with those provided for the Pacific Northwest and Washington State, with potential for some variation at any specific location. Observed rise in global greenhouse gas concentrations. Human activities have increased atmospheric levels of greenhouse gases (carbon dioxide, methane, and nitrous oxide) to levels unprecedented in at least the past 800,000 years (IPCC 2013). Observed warming in Northern Hemisphere. Each of the last three decades has been successively warmer than any preceding decade since 1850. In the Northern Hemisphere, 1983–2012 was likely the warmest 30-year period of the last 1400 years (IPCC 2013). Observed increase in average annual temperature for the Pacific Northwest. The Pacific Northwest warmed about +1.3°F between 1895 and 2011, with statistically-significant warming occurring in all seasons except for spring (Kunkel et al., 2013; Mote et al., 2013). This trend is robust: similar 20th century trends are obtained using different analytical approaches (Mote et al., 2003). All but five of the years from 1980 to 2011 were warmer than the 1901-1960 average (Mote et al., 2013). Projected increase in annual average temperature for Puget Sound. Warming is projected to continue throughout the 21st century. For the 2050s (2041-2070)[] relative to 1970-1999, temperature is projected to rise +5.5°F (range: +4.3 to +7.1°F) for a high greenhouse gas scenario (RCP 8.5). Much higher warming is possible after mid-century (Mote et al., 2015). Lower emissions of greenhouse gases will result in less warming. Ongoing variability. Natural variability will remain an important feature of global and regional climate, at times amplifying or counteracting the long-term trends caused by rising greenhouse gas emissions. Important modes of natural variability for the Pacific Northwest include the El Niño/Southern Oscillation (i.e., El Niño and La Niña) and the Pacific Decadal Oscillation. The size of projected change is large compared to observed variability. The Pacific Northwest is likely to regularly experience average annual temperatures by mid-century that exceed what was observed in the 20th century. Specifically, all scenarios project that, by mid-century (2041-2070), annual temperatures will be warmer than the warmest year historically (1950-1999, Mote et al., 2013). No change observed in annual precipitation for the Pacific Northwest. There is no statistically-significant trend towards wetter or drier conditions in Pacific Northwest precipitation for the period 1895-2011. Small changes projected for annual precipitation in Puget Sound. Projected changes in total annual precipitation are small (relative to variability)[] and show increases or decreases depending on models, which project a change of −2% to +13% for the 2050s (relative to 1970-1999, Mote et al., 2015). Observed increase in global ocean temperature. Ocean surface waters (top 250 ft.) warmed by +0.6 to +0.9°F from 1971 to 2009 (global average). Warming trends are evident at nearly all depths in the ocean (IPCC 2013). Projected increase in global ocean temperature. The oceans will continue to warm, and heat will penetrate from the surface to the deep ocean. Projected warming in the top 330 feet of the ocean is +1.1°F to +3.6°F for 2081-2100 relative to 1986-2005 (IPCC 2013). Projected increase in Washington coastal ocean temperatures. Ocean surface temperatures offshore of Washington are projected to rise by about +2°F by the 2040s (2030-2059, relative to 1970-1999) for a medium greenhouse gas scenario (the A1B scenario, Mote and Salathé 2010). Projected changes in winter sea surface temperatures in the North Pacific are expected to be as large as the range of natural variability by 2030-2050 (relative to 1950-1999) under a medium greenhouse gas scenario (Overland and Wang 2007). [] However, coastal ocean temperatures are strongly affected by coastal upwelling of colder water from ocean depths, and by large scale climate variability such as El Niño – current research is unclear as to how these might be altered by climate change. Observed rise in global sea level. Global sea level has risen about +7 inches since 1901. The rate of global mean sea level rise has accelerated during the last two centuries (IPCC 2013). Coastal areas in Washington will experience sea level rise, although some areas may continue to experience decreases due to trends in vertical land movement. According to a recent report by the National Research Council, sea level is projected to rise an additional +4 to +56 inches in Washington by 2100 (relative to 2000, NRC 2012). Locally, however, sea level will increase by different amounts in different places. Previous research projects a decline in sea level for the northwest Olympic Peninsula through 2100, for scenarios that assume very low rates of global sea level rise and high rates of vertical uplift (Mote et al., 2008; Reeder et al., 2013). These projections differ from the NRC projections due to different study approaches. Although most global projections would result in sea level rise for the northwest Olympic Peninsula, it is not yet possible to conclusively rule out a decline in sea level for that region. Short-term sea level variations can temporarily offset or accelerate trends. Sea level can be temporarily elevated or depressed by up to a foot in winter as a result of natural periodic cycles in climate patterns such as El Niño and the Pacific Decadal Oscillation (NRC 2012). This variability will continue in the future. Ocean acidification. The acidity of the ocean is projected to increase by +38 to +109% (IPCC 2013) by 2100 relative to 1986-2005 (or increase roughly +150 to +200% relative to pre-industrial levels, Feely et al., 2009) as global oceans continue to absorb carbon dioxide from the atmosphere. Local changes in Ocean Acidification are modulated by upwelling and runoff. Local conditions are also affected by seasonal upwelling of deeper Pacific Ocean water that is low in pH and high in nutrients, transport of nutrients and organic carbon from land, and oceanic absorption of other acidifying atmospheric gases. Observed decreases in spring snowpack in the Washington Cascades. Spring (April 1st) snowpack fluctuates substantially from year-to-year, but declined by about −25% overall (range −15% to −35%) in the Washington Cascades from the mid-20th century to 2006 (Stoelinga et al., 2009; Mote et al., 2008). [] This trend is due primarily to increasing regional temperature and reflects the influence of both climate variability and climate change (Hamlet et al., 2005; Pierce et al., 2008). Natural variability can dominate over shorter time scales, resulting (for example) in an increase in spring snow accumulation in recent decades (Stoelinga et al., 2009). Observed decreases in Washington glaciers. About two-thirds of the glaciated area in the lower 48 states (174 out of 266 sq. miles) is in Washington (Fountain et al., 2007). Although there are some exceptions, most Washington glaciers are in decline. Declines range from a −7% loss of average glacier area in the North Cascades (1958-1998, Granshaw et al., 2006) to a −14% decline in average area on Mt. Rainier (1970-2007, Sisson et al., 2011). There are no published trends for glaciers in the Olympic Mountains. Observed shift to earlier peak streamflow in the Pacific Northwest. The spring peak in streamflow is occurring earlier in the year for many snowmelt-influenced rivers in the Pacific Northwest as a result of decreased snow accumulation and earlier spring melt – the shift ranges from no change to about 20 days earlier (observed over the period 1948-2002; Stewart et al., 2005). Projected shift to earlier peak streamflow timing in Puget Sound. Peak streamflow is projected to occur 4 to 9 weeks earlier by the 2080s (2070-2099, relative to 1970-1999 Elsner et al., 2010) in four Puget Sound watersheds (Sultan, Cedar, Green, Tolt). Projected increases in winter streamflow for Puget Sound. Winter streamflow is projected to increase by +25 to +34% on average for Puget Sound by the 2080s (2070-2099, relative to 1970-1999; Hamlet et al., 2013). Increases in heavy rainfall events could further increase flood risk. Heavy rainfall events are projected to become more severe by mid-century. In Puget Sound, the yearly maximum 24-hour rainfall is projected to increase by +4 to +30% for the 2050s (relative to 1970-1999), based on results from 10 global models and a low (RCP 4.5) and high (RCP 8.5) greenhouse gas scenario (Mote et al., 2015). Preliminary results suggest an increase in the number of heavy rain events occurring in early fall (Salathé et al., 2014). These changes may result in more severe flooding in rain dominant and mixed rain and snow basins. Changes in flood management may not be sufficient to mitigate increases in flood risk. In the upper Skagit basin, for instance, with current flood management practices, the 100-year flood is projected to increase by 24% by the 2080s (2070-2099, relative to 1916-2006)[]; simulations indicate that changes in water management can only mitigate 7% of this projected increase (Lee and Hamlet 2011). Sea level rise will exacerbate coastal river flooding. Higher sea level can increase the extent and depth of flooding by making it harder for flood waters in rivers and streams to drain to the ocean or Puget Sound. Initial research on this issue suggests that the amount of area flooded in the Skagit would increase by up to 74% by the 2080s when accounting for the combined effects of sea level rise and larger floods (Hamman 2012). Projected increases in stream temperatures for Washington State. Stream temperatures are projected to increase in response to warming and decreases in summer streamflow. Projections for 124 stream temperature locations across the state find that more sites will experience temperatures that elevate stress for adult salmon (EPA, 2007). Many will exceed thermal tolerances for the entire summer season by 2080 (2070-2099), despite rarely being in excess of these temperatures in the recent past (Mantua et al., 2010). Elsner, M.M. et al., 2010. Implications of 21st century climate change for the hydrology of Washington State. Climatic Change 102(1-2): 225-260. Environmental Protection Agency, 2007. Biological evaluation of the revised Washington water quality standards. US EPA, Seattle. Feely, R.A. et al., 2009. Ocean acidification: Present conditions and future changes in a high-CO2 world. Oceanography 22(4):36–47, http://dx.doi.org/10.5670/oceanog.2009.95. Hamlet, A. F. et al., 2005. Effects of temperature and precipitation variability on snowpack trends in the Western United States. Journal of Climate 18(21): 4545-4561. Hamman, J.J., 2012. Effects of Projected Twenty-First Century Sea Level Rise, Storm Surge, and River Flooding on Water Levels in Puget Sound Floodplains and Estuaries. Master's Thesis, University of Washington. Kunkel, K. E. et al., 2013: Part 6. Climate of the Northwest U.S., NOAA Technical Report NESDIS 142-6. Lee, S-Y. and A.F. Hamlet, 2011. Skagit River Basin Climate Science Report, a summary report prepared for Skagit County and the Envision Skagit Project by the Department of Civil and Environmental Engineering and The Climate Impacts Group at the University of Washington. Mantua, N. et al., 2010. Climate change impacts on streamflow extremes and summertime stream temperature and their possible consequences for freshwater salmon habitat in Washington State. Climatic Change 102(1-2): 187-223.Fountain, A.G. et al., 2007. Digital outlines and topography of the glaciers of the American West: U.S. Geological Survey Open-File Report 2006–1340, 23 pp. Mote, P.W. et al., 2013. Climate: Variability and Change in the Past and the Future. Chapter 2, 25-40, in M.M. Dalton, P.W. Mote, and A.K. Snover (eds.) Climate Change in the Northwest: Implications for Our Landscapes, Waters, and Communities, Washington D.C.: Island Press. Mote, P.W. et al., 2008. Has snowpack declined in the Washington Cascades? Hydrology and Earth System Sciences. 12: 193–206. Mote, P.W. et al., 2008. Sea Level Rise in the Coastal Waters of Washington State. Report prepared by the Climate Impacts Group, Center for Science in the Earth System, Joint Institute for the Study of the Atmosphere and Oceans, University of Washington, Seattle, and the Washington Department of Ecology, Lacey, WA. Mote, P. W., and E.P. Salathé. 2010. Future climate in the Pacific Northwest. Climatic Change 102(1-2): 29-50, doi: 10.1007/s10584-010-9848-z. National Research Council. Sea-Level Rise for the Coasts of California, Oregon, and Washington: Past, Present, and Future. Washington, DC: The National Academies Press, 2012. Overland, J. E., and M. Wang. 2007. Future climate of the North Pacific Ocean. Eos, Transactions American Geophysical Union, 88, 178, 182. doi: 10.1029/2007EO160003, 178, 182. Pierce, D.W. et al., 2008. Attribution of declining western U.S. snowpack to human effects. Journal of Climate 21(23): 6425–6444, doi:10.1175/2008JCLI2405.1. Reeder, W. S. et al., 2013. Coasts: Complex changes affecting the Northwest's diverse shorelines. Chapter 4 in M.M. Dalton, P.W. Mote, and A.K. Snover (eds.) Climate Change in the Northwest: Implications for Our Landscapes, Waters, and Communities, Washington D.C.: Island Press. Salathé Jr, E. P., Hamlet, A. F., Mass, C. F., Lee, S. Y., Stumbaugh, M., & Steed, R. (2014). Estimates of twenty-first-century flood risk in the pacific northwest based on regional climate model simulations. Journal of Hydrometeorology, 15(5), 1881-1899. Stewart, I. et al., 2005. Changes toward earlier streamflow timing across western North America. J. Climate, 18: 1136-1155. Tohver, I. et al., 2013. Impacts of 21st century climate change on hydrologic extremes in the Pacific Northwest region of North America. Journal of the American Water Resources Association, in press. Van Vuuren, D. P. et al., 2011. The representative concentration pathways: An overview. Climatic Change 109(1-2): 5-31. Greenhouse gas scenarios were developed by climate modeling centers for use in modeling global and regional climate impacts. These are described in the text as follows: "very low" refers to the RCP 2.6 scenario; "low" refers to RCP 4.5 or SRES B1; "medium” refers to RCP 6.0 or SRES A1B; and "high" refers to RCP 8.5, SRES A2, or SRES A1FI – descriptors are based on cumulative emissions by 2100 for each scenario (VanVuuren et al., 2011; Nakicenovic et al., 2000). Scenarios used in this fact sheet range from a low (B1, RCP 4.5) to a medium (A1B) or high (A2, RCP 8.5) greenhouse gas scenario. The implications of the lowest greenhouse gas scenario – RCP 2.6, which assumes aggressive reductions in emissions – are not discussed in the text of this section. Trends are only reported if they are statistically significant at the 90% level or more. Results are often cited for the “2050s” or “2080s”. These refer to the 30-year average centered on each decade (2041-2070 and 2071-2100, respectively). Year-to-year variations in precipitation are about ±10 to 15%, on average. Projection based on regional climate model simulations, from the North American Regional Climate Change Program (NARCCAP) multi-model ensemble (http://www.narccap.ucar.edu). These simulations are based on results from 6 different regional models driven by 4 different global model projections, all based on the A2 greenhouse gas scenario, which is slightly lower than the RCP 8.5 scenario used in IPCC 2013. Values denote the average and the standard deviation among model projections. Results are averaged over a large area and may not be applicable to a given locale in Washington State. Based on analyses of 10 global climate models and the A1B greenhouse gas scenario. Although the acidity of the ocean is projected to increase, the ocean itself is not expected to become acidic (i.e., drop below pH 7.0). Ocean pH has decreased from 8.2 to 8.1 (a 26% increase in hydrogen ion concentration, which is what determines the acidity of a fluid) and is projected to fall to 7.8-7.9 by 2100. The term “ocean acidification” refers to this shift in pH towards the acidic end of the pH scale. These numbers indicate changes in April 1st Snow Water Equivalent (SWE). SWE is a measure of the total amount of water contained in the snowpack. April 1st is the approximate current timing of peak annual snowpack in the mountains of the Northwest. Average projected change for ten global climate models, averaged over Washington State. Range spans from a low (B1) to a medium (A1B) greenhouse gas scenario. Projected change based on the ECHAM5 global climate model and the A1B greenhouse gas scenario. Results for a low (B1) and medium (A1B) greenhouse gas scenario for 112 medium-sized watersheds in Washington. The Climate Impacts Group (CIG) is an internationally recognized interdisciplinary research group studying the impacts of natural climate variability and global climate change (“global warming”). Research at the CIG considers climate impacts at spatial scales ranging from local communities to the entire western U.S. region, with most work focused on the Pacific Northwest (PNW). Through research and interaction with stakeholders, the CIG works to increase community and ecosystem resilience to fluctuations in climate. The CIG focuses on the intersection of climate science and public policy/resource management. We perform fundamental research on climate and climate impacts and work with planners and policy makers to apply this information to regional decision making processes. Key areas of the group's collective expertise include but are not limited to: downscaling global climate model data; regional climate modeling; hydrologic modeling; water resources and terrestrial/aquatic ecosystem modeling and impacts assessment; coastal impacts assessment; climate change vulnerability assessment and adaptation planning; and outreach and education. The CIG is part of the College of the Environment at the University of Washington.